The Lady Cats’ volleyball team squeezed by a good Cumby team in the Lady Cats’ first scrimmage of the season Friday morning in Wildcats Gym. Three late successful serves by Anden Hammack give the Lady Cats a 65-62 advantage in points scored. The scrimmage marked the varsity debut for N’ysa Dugan, Lexie Whisenhunt and Sadie Stroud. Returning from last year for the scrimmage were Imani Taylor, Anden Hammack, Maggie McGlamery, Autumn Tanton, Abbi Baier, Kaylee Jefferson and Maddie Vickery. Returner Mieke VanBenthem was unavailable Friday but will be returning to the varsity along with her sister, Erica VanBenthem. During the Cumby scrimmage, Autumn Tanton looked good at the net collecting at least eight kills. Kaylee Jefferson had at least four kills and had one run of seven consecutive good serves for points. Lady Cats Volleyball Coach Justin Maness said it was a first scrimmage but he added he saw some good things. He liked Autumn Tanton’s play at the net. Coach Maness said Lexie Whisenhunt did a good job of setting the ball in her first varsity action. On the negative side, Coach Maness said he saw too many service errors. He noted some players were moved around and were playing out of position. Coach Maness also said Cumby was a really good Class A team. He said they made the Lady Cats play as they kept getting the ball up and putting it back on the Lady Cats’ side. Coach Maness said Cumby could turn out to be one of the best teams the Lady Cats play this year. Despite noting that the Lady Cats have a lot to work on, Coach Maness said the team looked better Friday than they did at this time last year. 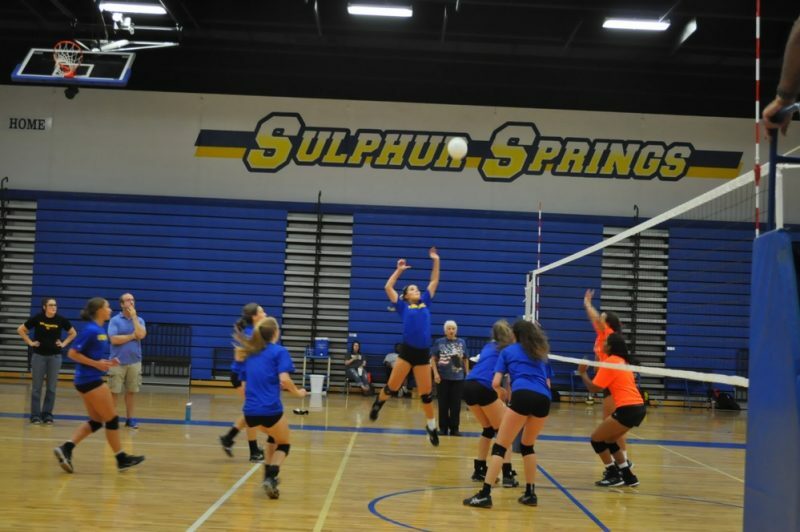 The Lady Cats also scrimmaged Commerce Friday in Wildcats Gym. They will scrimmage four more opponents in Wills Point Saturday beginning at 9 a.m. The Lady Cats open the regular season Tuesday in Wildcats Gym. They will face North Lamar at 1 p.m. Tuesday and then will play Sherman at 5 p.m.